Strike a pose for the first ever World Selfie Awards. How good's your selfie game? Defined as a photo of one's self usually taken in the mirror, the selfie movement has become a viral sensation across the web. The smartphone has played a pivotal role in making the selfie mainstream. Here at mobiles.co.uk we want to recognise the best in the business. From the creative to the outrageous, to the joyness to the broken. We aim to praise those individuals that go above and beyond and give us the gift that is the selfie. Win... and immortalise your entry forever with our crystalised awards. To gear you up for an award winning selfie, we've created 5 themes we're dying to see. Enter as many times as you like and keep the fresh ideas coming. We want to see you get creative with plenty of fun trhown in for good measure. Before you get your face on, have a glance at our terms & conditions. So we can admire your selfie, just tag #theSelfies on your nominated Facebook, twitter & instagram snaps. Couldn't be simpler. Just make sure your post is public so we can find you. You can also enter by uploading a photo to our facebook page, emailing us or tweeting direct to mobiles.co.uk with your name and story behind your pic. 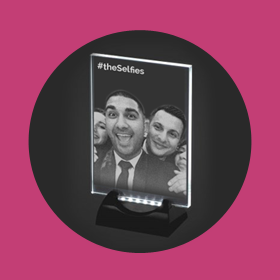 Enter before the 31st July for your chance to win one of our prestigous selfie awards.